Nutrition plays an important role in maintaining the health of your eyes. Eating a healthy diet in Joplin, MO is an extremely important part of the daily lifestyle choices you make for your overall well-being. Foods that you eat and the dietary supplements you take affect your overall health and may affect the health of your eyes. Eating the right foods won’t stop the aging process of our eyes, but it may help us achieve better eye health longer. What Type of Foods Promote Healthy Eyes? A healthy diet for your eyes should include plenty of colorful fruits and vegetables. Foods such as carrots, tomatoes, bell peppers, strawberries, pumpkin, corn and cantaloupe supply vitamins A and C, and carotenoids: the compounds that give these fruits and vegetables their yellow, orange, and red pigments. These are thought to help decrease the risk of many eye diseases. These foods also help because they provide beta carotene, vitamins C and E, as well as zinc. Orange yellow fruits and vegetables also supply zeaxanthin and lutein and as in the yolks of eggs. 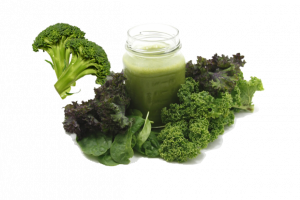 Leafy Greens such as spinach, kale, and collard greens, to name just a few, are packed with zeaxanthin and lutein, important pigments that are found in the macula of the eye. Broccoli, peas, and avocados are also a good supply of this powerful antioxidant duo. Fish (such as salmon, halibut, and tuna), walnuts, and flax seeds will all supply Omega-3 fatty acids which are important to overall health and eye health. One study of women who consumed seafood 2 to 4 times a week showed a decrease in their risk of occasional dry eyes by 45%. These same Omega-3 fatty acids may work just as well for men. A diet containing foods with a low glycemic index (GI) may also be beneficial to maintaining eye health. Swap refined carbohydrates for quinoa, brown rice, whole oats, whole-wheat bread, and pasta. The vitamins E, zinc, and niacin found in whole grains also help promote overall eye health. Kidney beans, black-eyed peas, and lentils are sources of bioflavonoids and zinc — thought to help support retinal health. 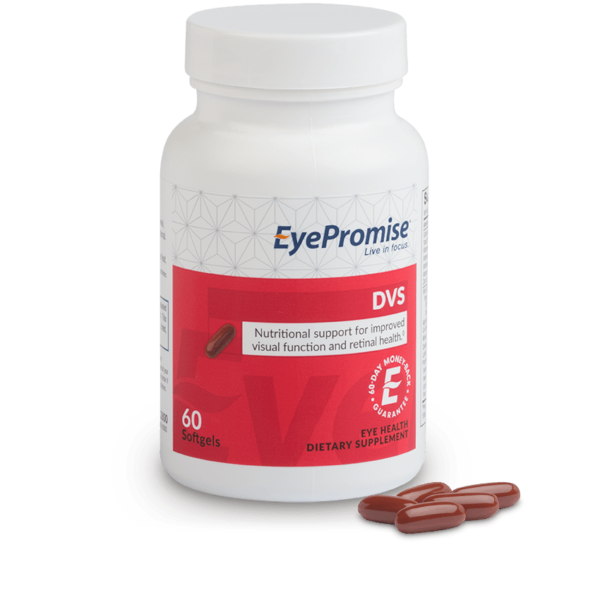 EyePromise® Restore is a comprehensive eye vitamin line formulated to preserve, support and improve vision for people concerned with age-related eye health. 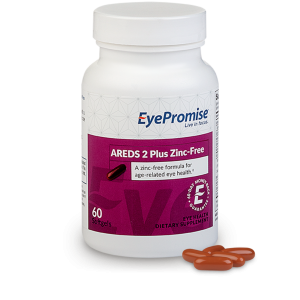 These eye health vitamins are made with nutrients outlined in the AREDS 2 study and include high levels of dietary zeaxanthin, a key nutrient that protects vision. Backed by 20 years of scientific research, the EyePromise Restore line is recommended by doctors across the country to those concerned with aging vision. Buy your supply here, and have it arrive right here, in Joplin. 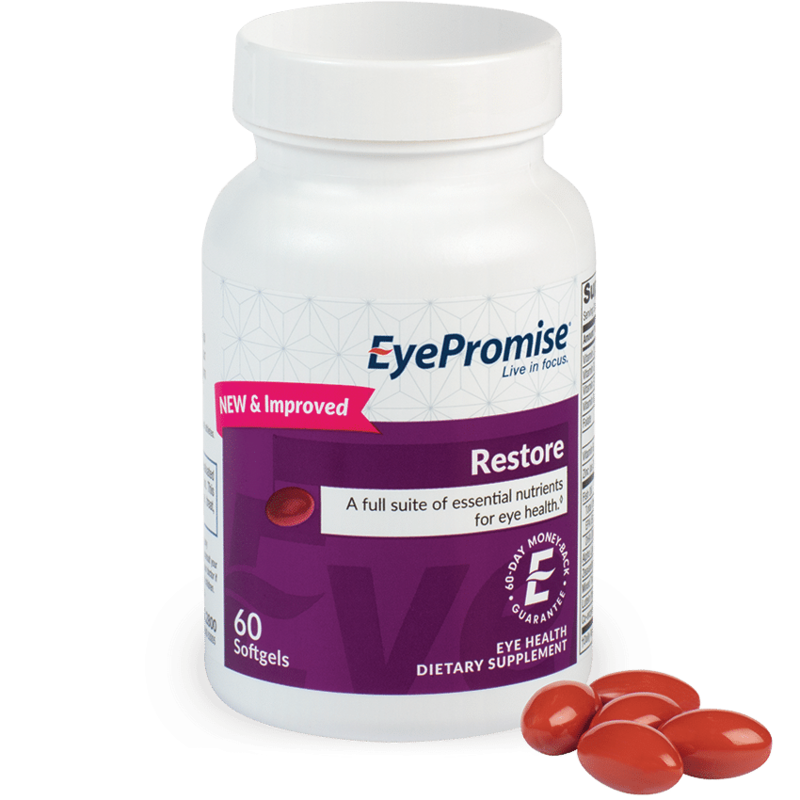 EyePromise® Restore offers a full suite of essential nutrients to proactively reduce the risk of developing age-related eye health issues. Don’t be reactive with your eye health. 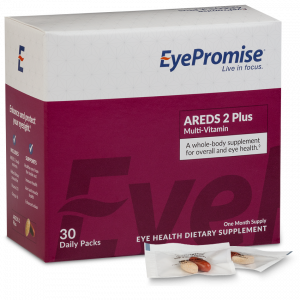 Be proactive with EyePromise Restore. Managing glucose levels while also having to worry about eye health can be difficult. That’s why DVS was formulated – to give your eyes the essential nutrients they need to support and protect eye health without impacting normal glucose levels. 40 percent of Americans suffer from occasional dry eye – a condition in which tear ducts don’t produce enough tears to lubricate the eye. 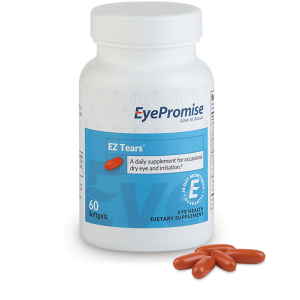 EyePromise EZ Tears is a daily eye vitamin to help relieve occasional dry eye and irritation. The EyePromise® Vizual Edge eye health vitamin line is designed to help people see better and react faster by supporting overall eye health and visual processing. 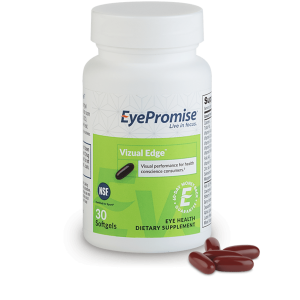 Backed by 20 years of scientific research and trusted by elite athletes, the EyePromise Vizual Edge line is guaranteed to make your vision the healthiest it can be. Even with a healthy diet, it’s difficult to get the right amount of nutrients needed for optimal vision. Vizual Edge can help decrease eye stress by lessening the impact of harmful blue light from computers and phones. Give eyes more of the essential nutrients they need to improve vision. 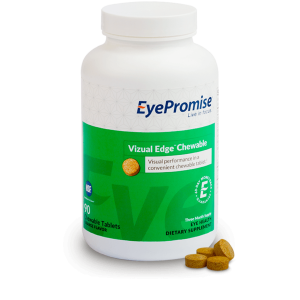 EyePromise Vizual Edge Chewable replicates the natural 2:1 ratio of zeaxanthin to lutein found in a healthy fovea to help rebuild macular pigment to preserve and enhance central vision and fight against age related eye health issues. This eye health vitamin is formulated to help both athletes and gamers enhance their vision and is available in one and three month supply bottles! How Important is Vision to Your Game? 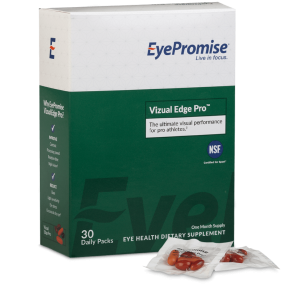 EyePromise Vizual Edge PRO® is an NSF Certified eye vitamin that helps athletes see better and react faster by improving the quality of our vision and increasing visual processing speed. Zeaxanthin has been scientifically researched to support MPOD levels, but is scarce in the average U.S. daily diet. 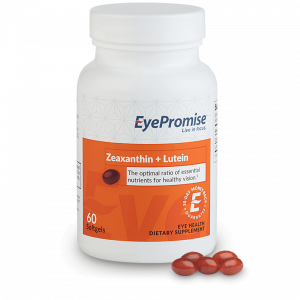 The EyePromise Zeaxanthin eye health vitamin line contains 10 mg of dietary zeaxanthin in one softgel – equal to approximately 20 ears of corn – helping bridge this dietary gap. 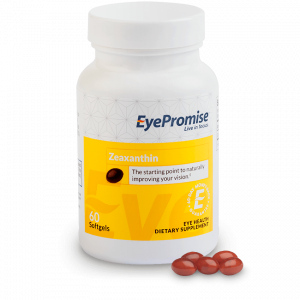 Backed by 20 years of scientific research, the EyePromise Zeaxanthin line is guaranteed to help protect vision from age-related eye health issues as well as provide nutritional support for vegans or vegetarians. Zeaxanthin, a plant-based nutrient that is not prevalent in the average American diet, is the key to helping improve eye health and protecting it naturally. Zeaxanthin provides a natural barrier between the back of our eyes (responsible for central and peripheral vision) and oxidants.